UsabilityHub Review: Legit Cash, Or Just A Scam? Today, I am looking into another Usability testing website. This is where you can answer questions relating to websites, in exchange for cash. Some Usability sites require you to record your voice or face during tests, but this one doesn’t and has much shorter tests than most. So, by participating in this and other websites like it; you can complete small tests for a certain amount of money. While it’s not a lot, the money certainly beats survey-related-websites. The main difficultly is, the availablity of tests and getting enough to make it worth your while! Overall rating: Legit! A quick & enjoyable way to make a small amount of pocket money. How much is going to depend on various factors, including your age/location & salary. *note – this company has since been rebranded as UserCrowd. What Is UsabilityHub & How Much Do They Pay? This company consists of mini tests you can complete & design surveys. You get paid per test or survey and can withdraw your cash once you have reached 100 credits. Each credit equals $0.10 an each test pays roughly this amount. However, it may be possible to earn up to 5 credits per test. They approximate that you could potentially make $6-$10 per hour if you were dedicated to taking the tests, but then tests also need to be available for you to do. UsabilityHub pays exclusively via paypal, so you will need to set up a Paypal account prior to cashout. You need to have $10 in order to cash out. The downside here is, it could take you some time to get to that amount, depending on how many tests you take and how many credits they’re worth. Signing up took just moments. If you’d like to sign up, simply check out the site here and follow the instructions. You’ll be asked some basic questions such as your time zone/household income/occupation. Once I was in, there weren’t any tests to take. However, after only around a minute of waiting, a test appeared that was worth 2 credits! There is an option you can select where it will continuously look for tests and also notify you with a sound when one becomes available. The tests are only 1-2 minutes long, so they’re much easier and quicker to take than regular surveys that you get on paid survey websites. The test actually took me around 10 seconds to do! No time at all. Only $0.20 but, it was so quick. In order to be aware of more tests, I switched on notifications. Definitey take this step!! That way, you will be notified whenever new tests become available right away. How many tests are available can also vary location to location, as people requesting tests can ask for testers from a particular country. You will be shown an image for only 5 seconds and then you need to honestly answer some questions about what you can remember seeing/your initial impressions. This sort of test is common on Enroll App as well – it’s where you will be asked where you think you SHOULD click on the website page. There is no right or wrong answer, but this can tell designers a lot about how well you will be able to navigate the site and do what they intend you to do! You will be given some instructions on how to navigate a website, or complete a task on the website. This will tell developers a lot about how easy a site is to navigate, or how complicated completing certain tasks are. Here you’ll simply be asked a select number of questions about an image you’ll be shown. Again, no wrong answers here. Just be honest and say what you feel. This was the first test I did. I was shown a picture of a collection of alarm clocks. After which, I was asked which one I preferred and why. I gave a detailed explanation of why I preferred a particular model. Tests are super quick and easy to do. You get to share your opinion on real products and services, which can help website developers and desingers. Simple to set up & easy to navigate. 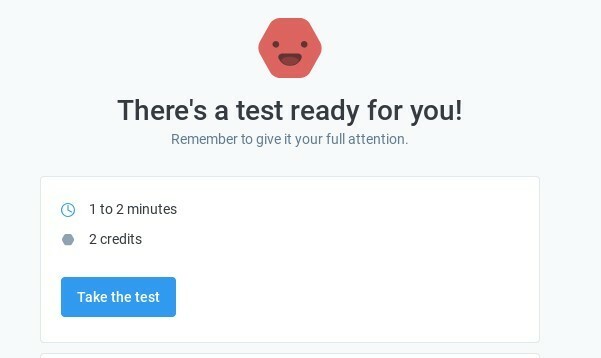 You can get automatic notifications for new tests. You may lack tests, it will depend on your age/location/income. $10 can take a while to reach, depending on test availability. You may have to wait 30 days after reaching threshold before your test answers are verified and you’re paid. Before you cash out, you will need to have all your answers assessed. If you haven’t answered honestly, or it’s apparent you’ve rushed the test and not given a thorough response, then they could reject your answers. Assessing your responses could take up to 30 days before they actually pay out. So, it’s worth checking out some of these pointers,to make sure that you get your payout! Read through all the instructions slowly and carefully. If you rush reading the question, you are far more likely to interpret and answer the question wrong. Give your best effort for every single test. Just rushing through and not giving your best response, could lead to some of your answers being rejected by clients. Give lots of information in your response, make sure it’s detailed. Be polite – but be honest! Don’t just give praise, but ensure any criticisms you do give are constructive. For example: “the colour of the logo doesn’t work for me..” “This is not to my taste because…” “I’m confused what I should be doing on this site…” would all be fine. But simply saying something like: “This is useless/rubbish,” or that you hate it – is not constructive and is just rude. If something seems wrong, in error, or inappropriate during a test, you should report it rather than completing the test. Is Usability Hub Legit – Or Just A Scam/Waste Of Time? I have enjoyed my time so far at Usability Hub. I like the fact that the tests are so short, but time will tell how often I will be able to take tests. I will update this post in the future and let you know how it’s going. As I’m based in the UK, I’m wondering whether I may be sent less tests than someone in the US. The only way you can know, is to check it out for yourself. I recommend signing up to a few different usability testing sites and then you will be able to earn much more over time. If you’re fed up of opportunities where you’re always waiting on tests to show up or become available, then maybe you should think about setting up your own business online. By creating something that you own and run online, the work you put in now can potentially pay off multiple fold in the future. Even if you’re not looking to generate a full time income – what if you’re just after more substantial pocket money, like several hundred dollars a month? That will also work…. I make the most online right now via affiliate marketing. There is a really low barrier to entry with it, because it’s not expensive and it’s also good for beginners, because you don’t need technical knowledge to start learning. Another great thing about it is that it can lead to passive income over time. The effort and work you put into it in the beginning, will start to pay off over time and gradually snowball. Learn how it’s done here. If you have any questions, or you have some experience with Usability testing that you’d like to share – please leave me a comment below!